Sometimes an event presents itself that defies logic. 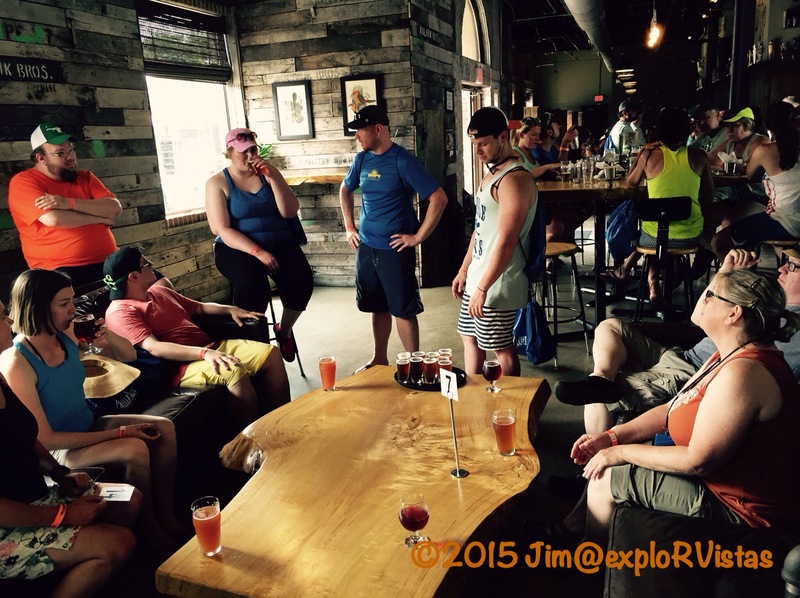 After all, what sane person would jump in their kayak and paddle from brewery to brewery along with 125 other kayakers? 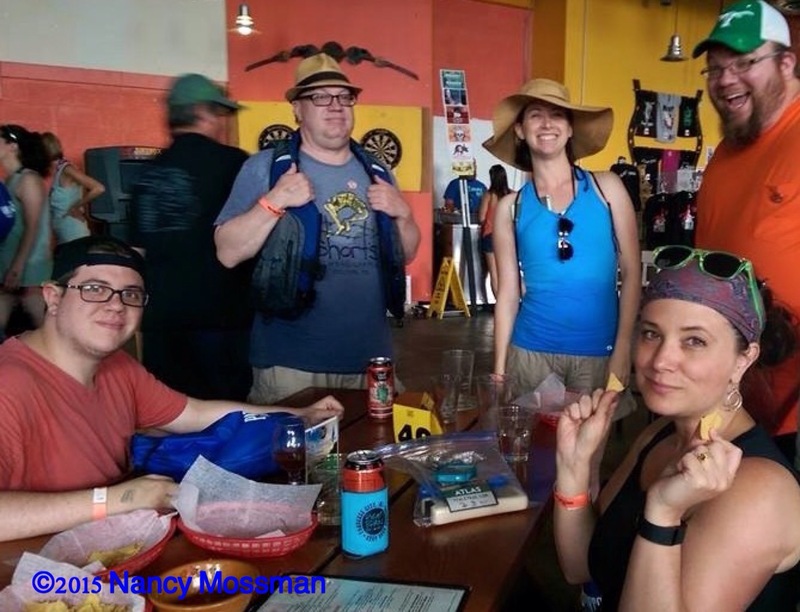 Well, when Diana’s cousin Abby told us about Paddle for Pints in Traverse City, and proposed that the family join the Ale Trail, how could we refuse? On Monday, we made our way down to Traverse and joined in the fun! 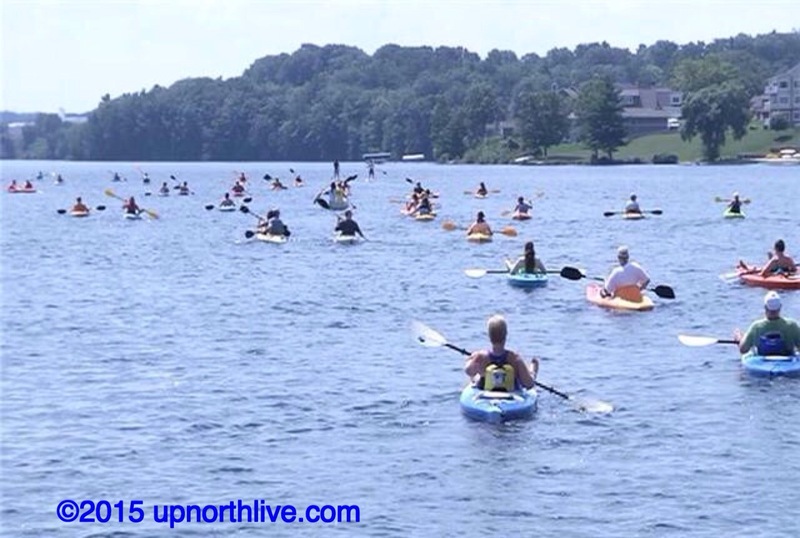 Paddle for Pints starts out on Boardman Lake on the south side of town, follows the Boardman River through the city, and ends at Clinch Park on Grand Traverse Bay. On a normal summer day, it is a fairly easy paddle. Monday was a bit different, and it offered up a couple challenges. There was a stiff 20 mile-per-hour breeze coming from the south, out ahead of a cold front that was approaching from the northwest. On top of that, the National Cherry Festival was in full swing. The cherry capital was packed with people! As we were checking in, the U.S. Air Force Thunderbirds streaked overhead as they were leaving town. 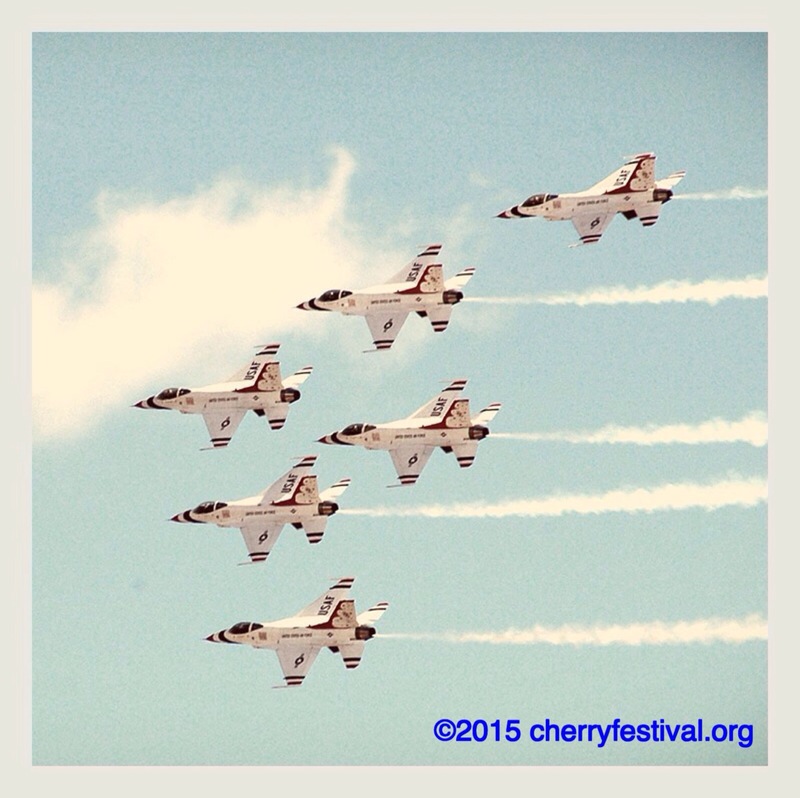 They had performed a series of air shows over the weekend for the cherry festival. The power behind a squadron of F-16’s commands your attention! 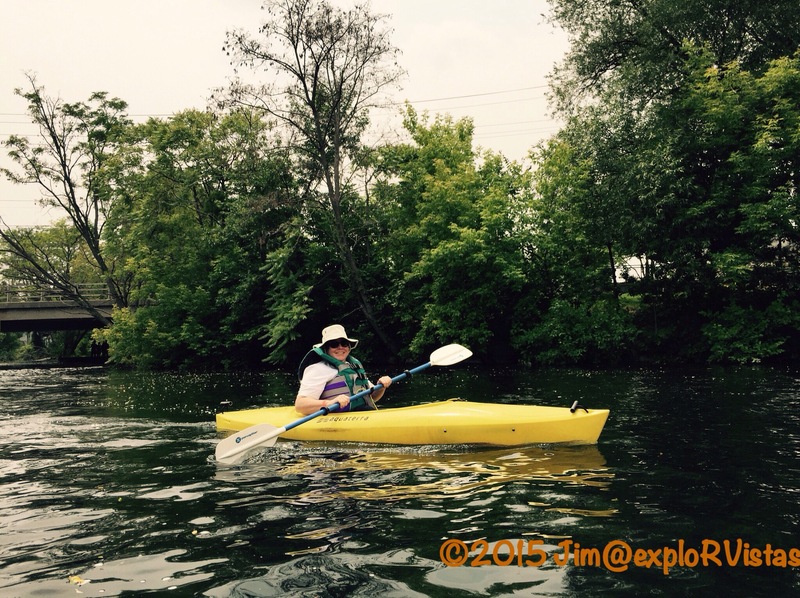 The first leg of our paddle was from the north shore of Boardman Lake at Hull Park. A special note: When we purchased Ketchup and Mustard (our kayaks) twenty years ago, Hull Park was the place that Eastern Mountain Sports allowed us to compare brands of boats. This was a homecoming of sorts. 🙂 On this day, we paddled to Right Brain Brewery, about 1/2 mile south along the lakeshore. As previously mentioned, there was a strong southerly breeze, so my camera stayed safely packed away. The above photo was from a previous event on a much calmer day. We plowed straight into the whitecaps and did just fine. At Right Brain, from left: Michael, Tim, Abby, Emily and Thomas. From left: Marlana, David and myself. The trip back to the river entrance on the north end of the lake was fairly easy, as the wind was at our backs. Once we were on the river, the wind was no longer a factor. 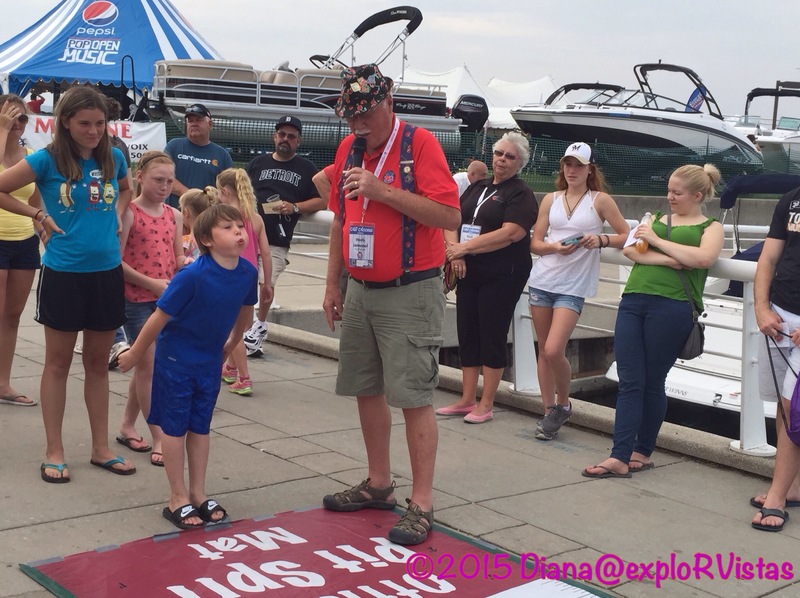 While this event was mixing boating with drinking, everyone was behaving responsibly on the water. For us, we were enjoying seeing Traverse City from a perspective that we had never seen before. As stated in previous posts, we have been coming here since the 1970’s, yet we have never paddled the river through town. As evident by the smile on her face, Diana was having a great time! Halfway through town, we had to portage around the dam. It was at that point we visited our next two breweries. While at Rare Bird Brewery, we were able to grab something to eat to go with our beverages. Diana managed to get us a couple of leather couches around a huge coffee…er…beer table while we waited for the food. From left: Abby, Thomas (standing), Michael, Marlana, Josh, Ben, Diana and Tim. Not pictured are Emily, Nancy, David and myself. Back on the river, we had one last paddle to complete. We had only hit three breweries over the course of three hours, so everyone was fine. As seen in the photo above, there was a pedestrian bridge with several supports extending into the river. Just as we approached it, two girls managed to get their kayaks sideways and block off most of the river. Diana backpaddled until a hole opened up and managed to shoot through. 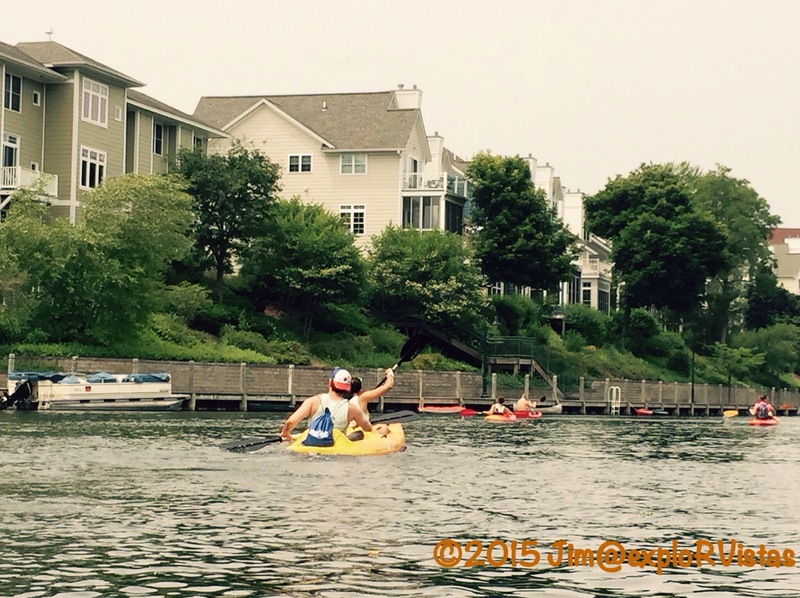 I was tangled up with one of the girl’s kayaks, and as I pulled her bow around, my kayak got sideways. I had to lean downriver to keep from swamping my boat, and I was able to get my bow around and through the bridge supports. Whew! 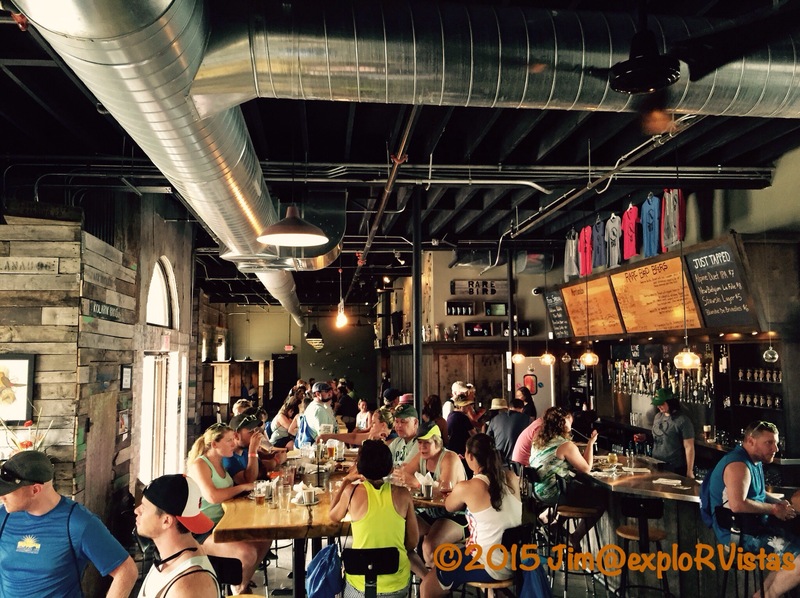 Once on shore, there were several more breweries within walking distance. We chose to forego visiting them and instead rode back to retrieve our vehicles from Hull Park. Diana’s cousins had to get back to Luzerne, Michigan…an hour and a half east…so they headed home, once they loaded up their kayaks. Diana and I only had a 20 minute drive back to Wild Cherry Resort, so we decided to check out the National Cherry Festival, seeing the marina was smack dab in the middle of it. 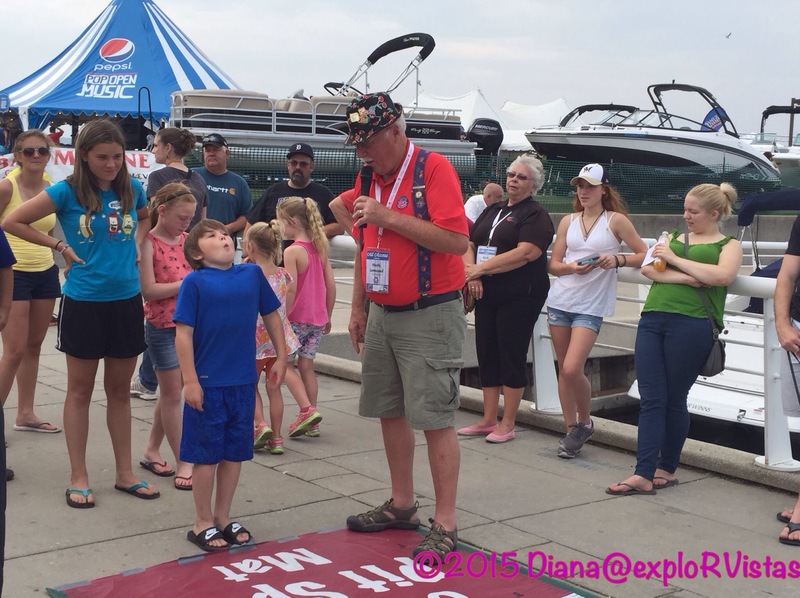 While we were there, we saw some of the children’s portion of the cherry pit spitting contest. We found it to be amusing to watch the kids. 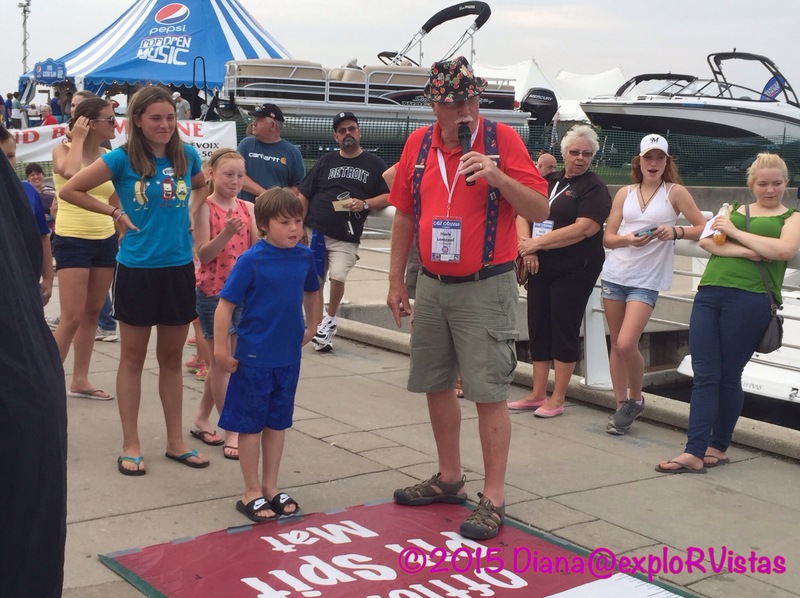 We were amazed to find out the pit spitting record in Traverse City is 88 feet! The official world record is 95 feet, but the unofficial record is 110 feet! 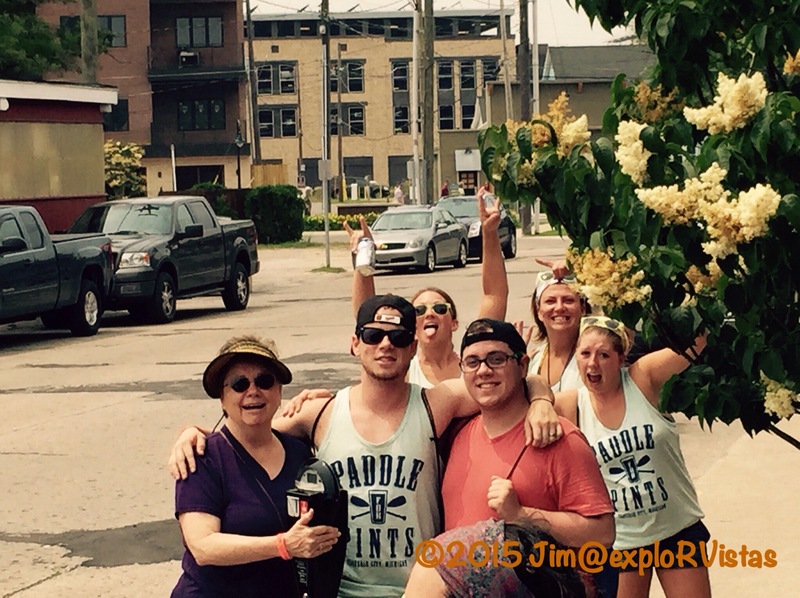 Paddle for Pints proved to be a great time. Though we were apprehensive about the wind at the beginning of the event, we all made it through safe and sound. Diana and I enjoyed seeing Traverse City from a vista we weren’t used to seeing it from, and breweries we hadn’t had a chance to experience. Previous PostA little weekend jaunt to Alton, IllinoisNext Post Workin’ Hard and Playin’ Often! You guys are having way too much fun! We’d definitely be there on our kayaks! Just made our maiden voyage on our Sea Eagles (inflatables) and had a blast – just on a quiet Cascade mountain lake with eagles! and no beer! So cool, Kathrun! 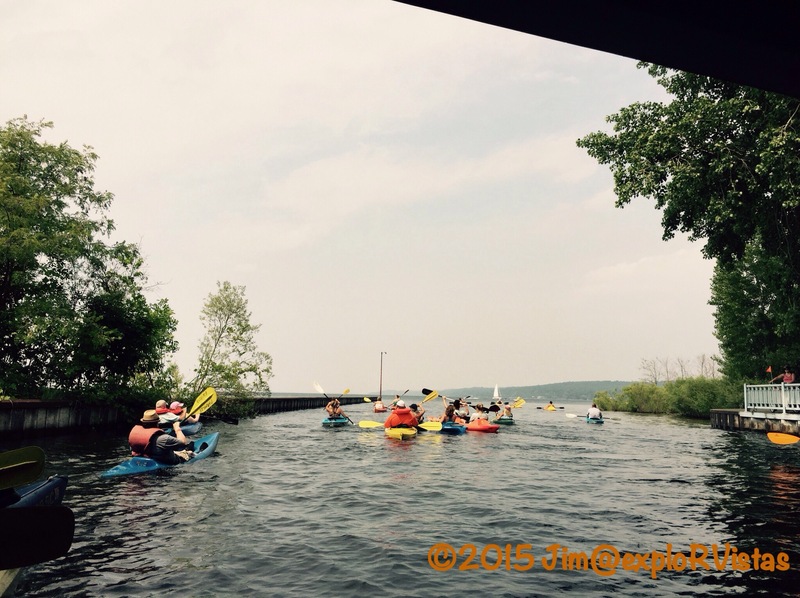 That Cascade lake sounds more what we are used to, but we really got a kick out of this event! OMG! That sounds SO FUN!! We’re going to have to get back there for that in a couple of years!! Kayaking, beer (Steve, I don’t like beer) and cherries! YUMM Doesn’t get much better! Yes, Debbie…you guys would love it! Most of the breweries serve hard cider, so I was covered with my gluten allergy. That glass in the foreground on the big table at Rare Bird was my cherry cider. 🙂 Paddle for Pints started out with 8 dates this summer, each with three waves. They sold every one of them out! So they added 11 more dates, also with three waves each…and those are almost all sold out! 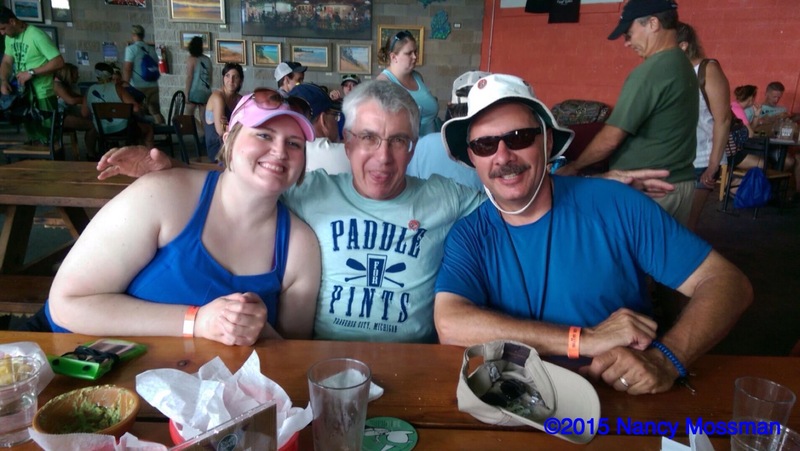 Check out paddleforpints.com. Whatever year you do decide to come, book early! I’ll bet you and Al would love it, Ingrid! Okay that looks and sounds like a great time. Two of my favourite things, add wine and you’ve got it all. Sounds like a great day on the water and a fun way to paddle with friends. It was definitely a lot of fun, Bonnie! Sounds very tempting to me !! Kayaking is difficult but if I have a purpose, I think I would enjoy it more ! If you notice the photo of Diana’s kayak, ours are fairly wide and stable. They are extremely easy to paddle and keep upright. What a great idea. We would love to do something like this. Gotta love Michigan. That looked like a ton of fun!! 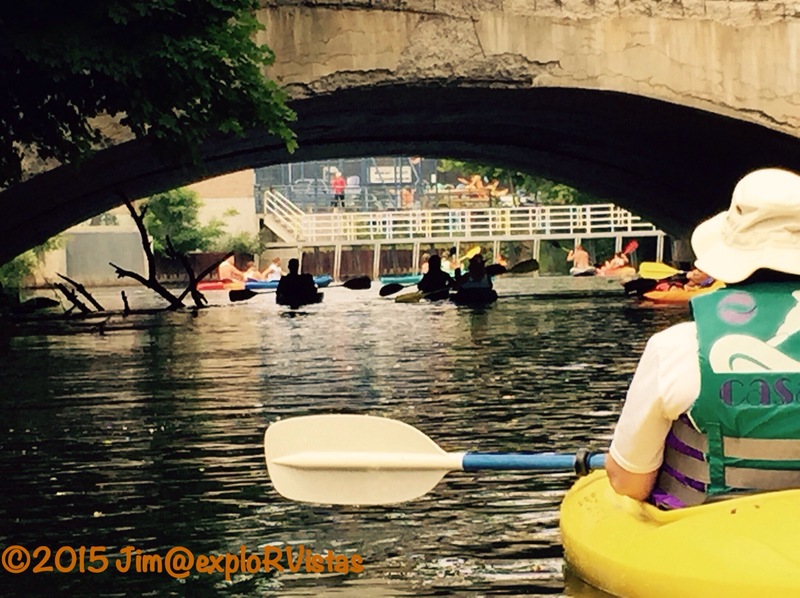 Looks like the northern version of the San Antonio river walk — except in canoes, kayaks and with beer! 🙂 What fun. And what do people have more fun doing than eating and drinking… you’re channeling millennia old instincts there. Great post. Thanks, Peter! That event had Milwaukee written all over it. I was really glad Diana’s cousins suggested it! Ya know, as much noise as I make about not liking large groups of people, one thing that I love is when you see large groups of people ENJOYING themselves — so long as they aren’t acting like drunken idiots and disrespecting others! And that was the really nice thing about this: people were having fun, but not getting drunk. Those photo-bomb girls were just being silly, as they saw my camera come out. I’ve seen people on wine tours be rowdier than anything I saw on the ale trail. As I told Dave in an earlier comment, we would do it again. Well, yeah…. photo bombing is fun, right! I’ve been known to do it myself. I really like the idea. And I’d think it’s safer than the Winter past-timer in WI where snowmobilers spend all day long riding from one bar to another bar. High speed, snow, alcohol and barbed wire fences don’t get along well together. Looks like you guys had a great time. Do you know if they have a paddle for wine event? No, as there are not any wineries near a river up here. Paddle for pints, now that should like my kind of paddling;) Looks like you had an awesome time. It is always amazing what a new view you get of a place once you see it from the water isn’t it?